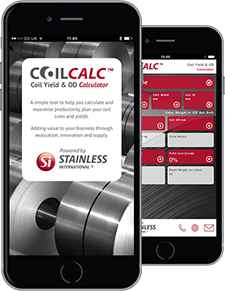 Stainless International has developed and built CoilCalc™, a Coil Calculator App. for Apple iphone and Android smartphones. CoilCalc™ is a simple, fast and accurate tool, to calculate metal yield from Coils and the Coil dimensions you need to optimise production and add value to your business. It enables mobile working for your production planning. A superb training aid, to assist and educate your team in the complexities of Coil calculations. • Select metal type, from Stainless Steel 300 series; 400 series; Aluminium; Carbon Steel; Galvanised Steel. CoilCalc™ is available in Apple and Android and can be found in the Apple iTunes Apps Store and Google Play for Android Apps. Just search for CoilCalc™. The App is in the productivity section. Stainless International continue to innovate, to offer solutions that support customers to find new efficiencies and take cost out of their Supply Chain.